Note: this snapshot has been updated to reflect changes to EPI’s estimates of the dollar value of workers’ gains due to various minimum wage increases. At the beginning of 2018, 18 states will increase their minimum wage, providing about $5 billion in additional wages to 4.5 million workers across the country. In a majority of these states, minimum wage increases (ranging from $0.35 in Michigan to $1.00 in Maine) are the result of legislation or ballot measures approved by voters in recent years. 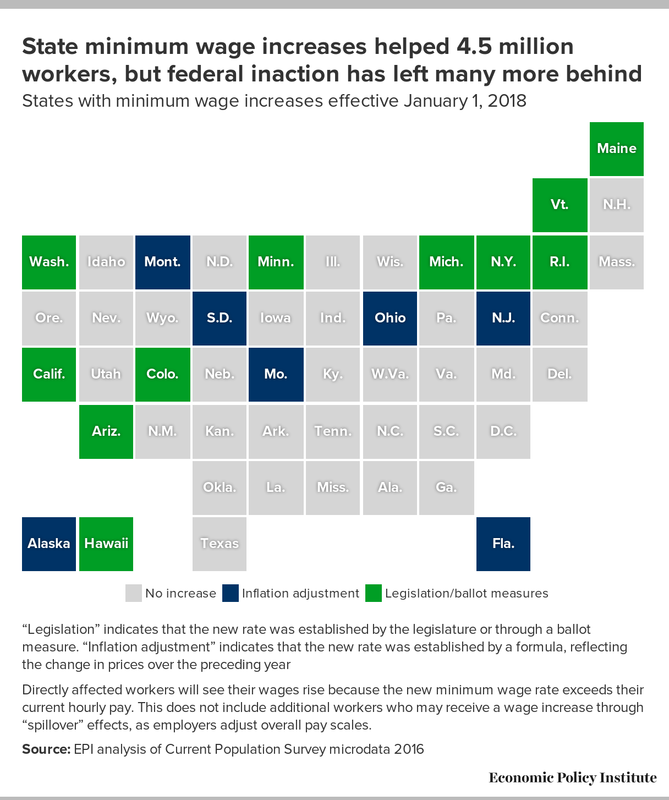 Eight of these states (Alaska, Florida, Minnesota, Missouri, Montana, New Jersey, Ohio, and South Dakota) will have smaller automatic increases that adjust the minimum wage to keep pace with price growth. This automatic inflation adjustment preserves the buying power of the minimum wage, which has steadily eroded over time. New York’s minimum wage increase took effect on December 31, 2017.